"On February 22, 1900, the first Fourth Degree exemplification or degree ceremony was held in New York City. The Fourth Degree imparts a lesson on the virtue of patriotism. The primary purpose of this degree is to foster the spirit of patriotism in members and the community at large and encourage active Catholic citizenship. Today there are some 300,000 Fourth Degree Knights out of the total 1.6 million member Knights of Columbus. 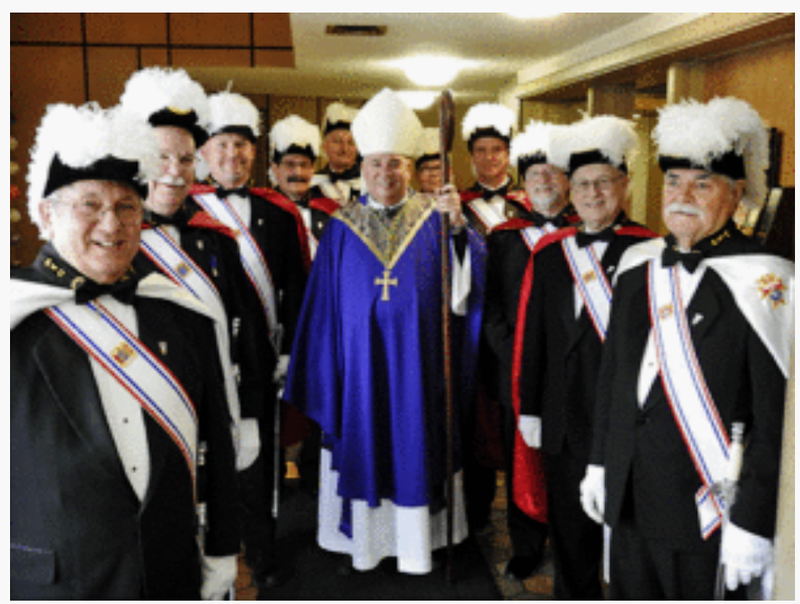 Local units, called assemblies, draw their members from Knights of Columbus councils. Qualifications for membership in the Fourth Degree are: membership in the Knights for at least one year and being a Third Degree Knight. A Fourth Degree Knight may become part of the assembly's color corps. These members are recognized widely by their distinctive attire of tuxedo, feathered hat (chapeau), cape and sword. These members regularly take part in civic events such as parades and wreath-laying ceremonies, and at ecclesial functions at Catholic churches. The various colored capes and chapeau feathers denote different officer positions within the Fourth Degree."